It was a great end of the year with lots of familiar faces and good fishing, even when the weather didn't cooperate. Offshore fishing has been hit and miss, with more tunas than anything else lately. 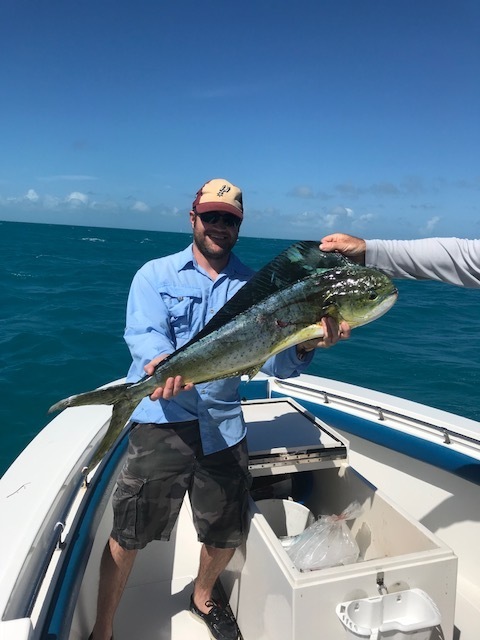 The reef has been good for yellowtail snappers if the offshore bite slows. On the windier days, we've been doing more inshore channel fishing, which has been consistently good. Lots of keeper sized muttons and yellowtail snappers, jewfish, sharks, jacks, and assorted other species. I did 2 inshore trips with the Balsamo family this week, we stayed close on the first trip and caught a bunch of mutton snappers and a big blacktip shark. The second day we went for variety out at the marquesas and had tons of action with snappers, jacks, grouper, and some big sharks. We had numerous nurse sharks and a big bull shark around 200lbs. Charles Jr. fought the fish while I chased it around the lobster traps with the boat. After about a 45 minute fight, we got the leader and let her go. Big thanks to everyone that came down to fish with me this year! Looking foreward to next year! Riding out with the Littens.